This paquebot mark was used at Liverpool, in black, and is dated 11th March 1895, again an early usage. Robertson type P30 in use 1894-95 (Hosking fig 7). 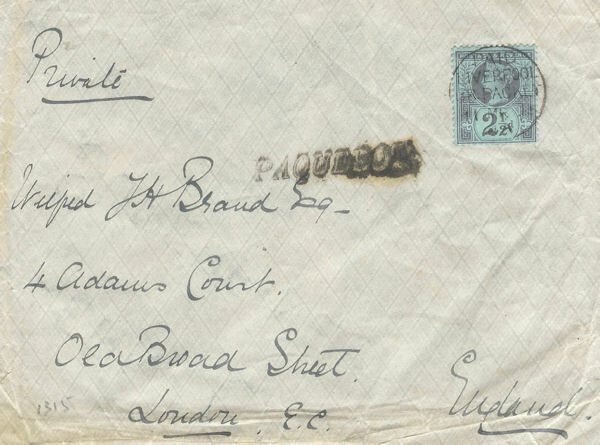 The stamp is cancelled with a Robertson P17 'PAID / LIVERPOOL / BR PACKET' mark in use from 1858 - 1902. Tabeart notes that from 1860 this packet mark was used predominantly on West African Mail brought to Liverpool on the African Steam Ship Co. and the British and African Steam Navigation Co. (Elder Dempster Lines).